Are you looking for recipes that are worth saving and sharing with friend and family? I hope you will find it as rewarding trying my delicious cooking recipes collection as I have putting them all together for you. My collection of Cooking Recipes started years ago and continues to grow when recipes are shared during family events and parties, work food days, card game night (usually poker with good friends), holiday get-together. Whenever I had something good to eat, I asked for the recipe. Some are my own recipes that I have prepared many times through the years. There is a large number of Appetizers, Salad Recipes and Seafood Recipes, as I am crazy about them and tend to prepare these dishes the most. I have a big family and we spend a lot of time together. Thanksgiving Dinner is usually at the family farm. The hunters would get their deer, hopefully by Thursday, those that don't hunt get dinner ready. Everyone brings a dish of something. Of course the traditional Thanksgiving recipes are also made, like the delicious gooey nutty sticky buns, cranberry relish, pudding fluff and Mom's wonderful pies for dessert. It becomes a tradition for people to bring the same yummy dish again and again. As you can imagine, I have quite the collection of notes, scraps of paper, napkins, and menagerie of file cards thrown into many shoe boxes. I try to give credit if possible to the many good friends and family members who have passed the recipe to me. welcome to my recipe site. This is my cooking recipes collection from the last 40 or so years that I am very proud and happy to share. You will find everything from Crock Pot Recipes to Holiday Recipes. My most popular page is appetizers because they are the most versatile and sometimes are enough to make a meal. and go south of the border? My Mexican Recipes are from many years ago, I don't even know where I got them from. I have used them so much the paper is yellowed and stained. Check out the Enchilada Recipes. Complete your meal with some homemade Mexican Sauces. I hope you will enjoy these recipes as much as I have over the years. Being married into a Greek family, learning how to cook some Greek food came naturally. YaYa was the first to show me how to properly prepare a leg of lamb for roasting. 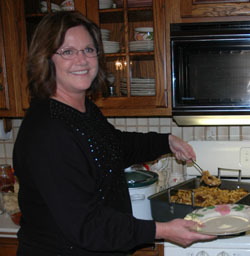 My mother-in-law and I cooked and baked together for all the holidays and Sunday dinners. It was an event, getting all the ingredients ready and then preparing and assembling the recipe for a meal of Lamb and Noodles or making pastries, such as Baklava for desert. Oh... the yummy rich Greek pastries. There is nothing like them. I have prepared and/or eaten every one of these recipes in my collection, so I can attest to the quality and flavor being very good and feel confident you will enjoy them as much as I have. Look to the end of many recipes for a few helpful tips and time savers I have found useful when trying to make them quick and easy recipes. Have fun looking through my site and when you find those special recipes, I hope you will enjoy preparing them and sharing with your family and friends. Who knows, they may become your specialty dishes to bring again and again to the next family or friends get-together. My cooking recipes collection is constantly growing so be sure to bookmark as one of your favorites to come back often to see all the new updates. This site has been submitted to xtlinks for web directory.